The launch event went ahead on Saturday despite the snow and I was so impressed by the number of people who braved the freezing conditions to have a chat and share their ideas. 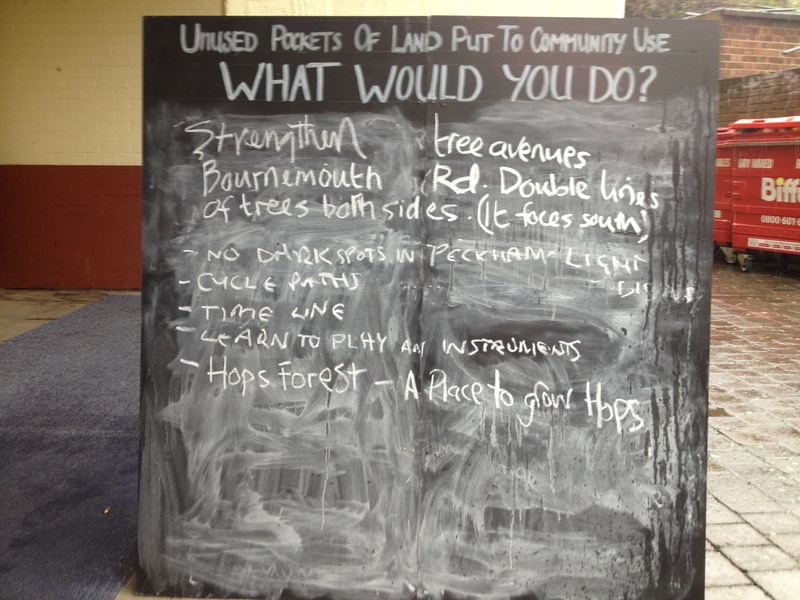 Here are some of the thoughts people shared. 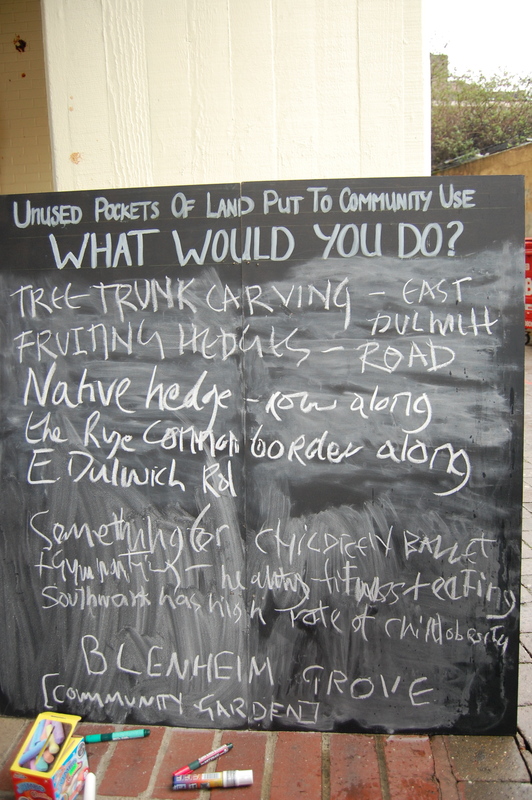 There were some really great conversations going on too, we heard of an idea for a overhead garden in Peckham, lots of great business ideas, thoughts for film events, ideas to use the multi-story car park, loads of offers to get involved, a community garden, monthly markets, communal cooking, art exhibitions and many many more! 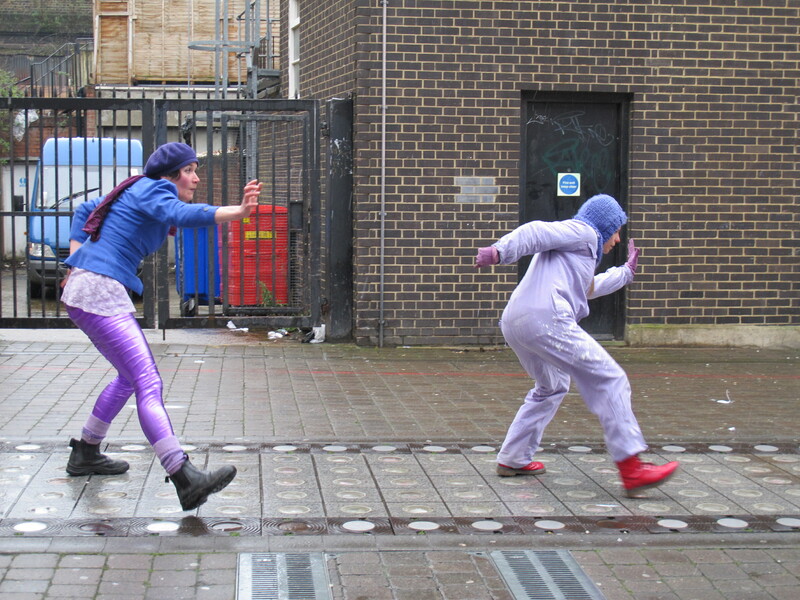 The Purple Ladies came to brighten the place up with their inprovisation, a big thank you to them! And everyone kept warm with a mug of hot lemon and ginger and made smoothies on the Smoothie Bike. 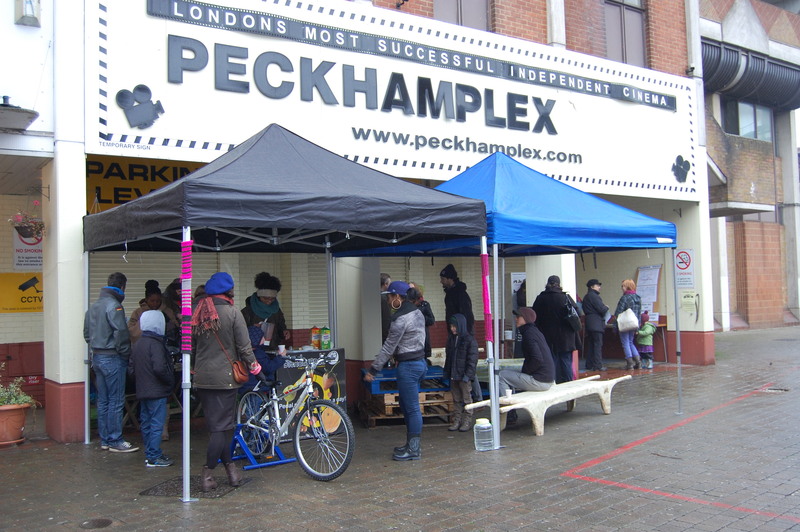 Local design studio JailMAKE generously made two beautiful benches for the event, thank you to them and thanks to Peckham Plex for providing us with shelter. Thank you also to the army of helpers Sustrans or otherwise that helped to make it happen on the day. Extra big thanks to everyone who came on Saturday, and for those that missed it there will be plenty of opportunities to get involved starting 11th May. More details to follow, get in touch if you want to join the mailing list! we knew it anyway but good to see it in print…..
Lovely, thanks Charlie. I’m collecting these kihnd of desighn against crime kind of ideas…although I know that that is actually a design group at Central Saint Martins I think… will have to check them out too. Any other links in that vain are very welcome. I think the weather/ climate is finally becoming different enough that tree cover and urban shade needs to be thought about. I love tent fabric structures and brought one to east London over the bus station at Stratford. i also had a whacky scheme from the Royal College of Arts for a sheltered street market stall design. That one never happened, but the idea of student designers and engineers getting into the logistics of street market design is good I think. Re the privacy and overlooking debates, we were always taught at urban design lectures that to make things safer, the design should be reflecting that most of the time you will be at home not on the street, but during the time you are indoors strangers ‘police’ streets and the residents ‘police’ the strangers as they look out of their windows at the strangers.So have lots of opportunities for windows overlooking the places people walk through. Nice windows stick out so you can look up and down the street as well as straight across…use oriel windows for example or bay windows. They also suggest corner windows so you look out both ways on corners. 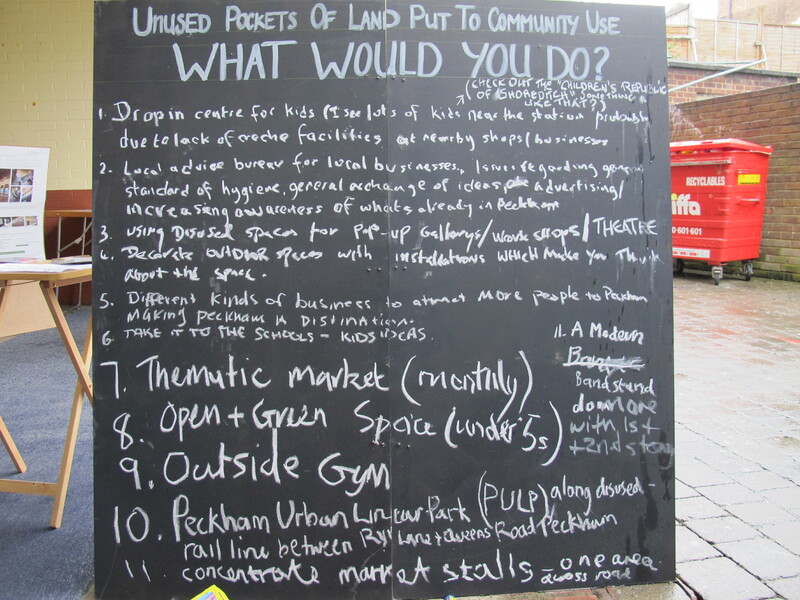 Would be great to get students involved with street market design, there are some ideas floating about to bring themed markets to Peckham every month or so, mainly they are a collection of local traders and stalls. Interesting to create a low cost, effective design to make them all function as a whole market. We are hoping to work with the businesses and market traders and hopefully we can rely on them to keep an eye out over the spaces if we manage to tidy the spaces up and maybe find ways to recycle their rubbish in return. Are you coming to the workshop on 11th, be great to have another Urban Designer there.